Left: transformation matrix for two-dimensional coordinates; right: transformation matrix for three-dimensional coordinates; R - rotation, S - scaling, P - perspective, T - translation, G - global scaling. 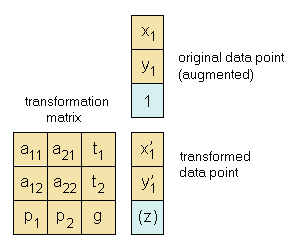 In order to apply homogeneous transformations the (augmented) original data vector is multiplied by the transformation matrix. The resulting 3rd or 4th coordinate is either discarded or used to create a perspective view (see 3D projections).